Lulu is the perfect character to introduce preschoolers to new experiences and here she is welcoming her new noisy baby brother. 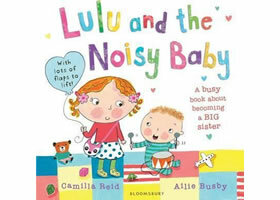 With an accessible, warm and reassuring text and interactive flaps to lift on every page, Lulu and the Noisy Baby offers a gentle introduction to the arrival of a new baby through the eyes of the older sibling. Popular, trusted and reassuring, the Lulu picture, novelty and board books make the perfect companion for inquisitive little minds.